One of the most controversial engagements of the Civil War was the storming of Bolton by Royalist forces under the command of Prince Rupert on 28 May 1644—an action in which both Sir Thomas Tyldesley 1612-1651 and the Earl of Derby were involved. The initial assault failed, but the town was taken in a second attack, with much bloodshed. Subsequent propaganda from the Parliamentarians termed this significant loss of life "the Bolton Massacre". Why was the storming of Bolton marked by such deep enmity? There appear to be at least two factors in play. First, many of the Parliamentarians in the Bolton garrison had previously been involved in the unsuccessful first siege of Lathom House—the seat of the Earl of Derby, which had been ably defended by Charlotte Stanley, Countess of Derby. Second, after the failed first assault on Bolton, the Parliamentarians had hanged—in full view of the Royalists—a captured Captain, in the apparently erroneous belief that he was "an Irish Papist". No doubt this would have particularly enraged the Catholics in the Royalist forces—including those serving under Sir Thomas Tyldesley. May 25. 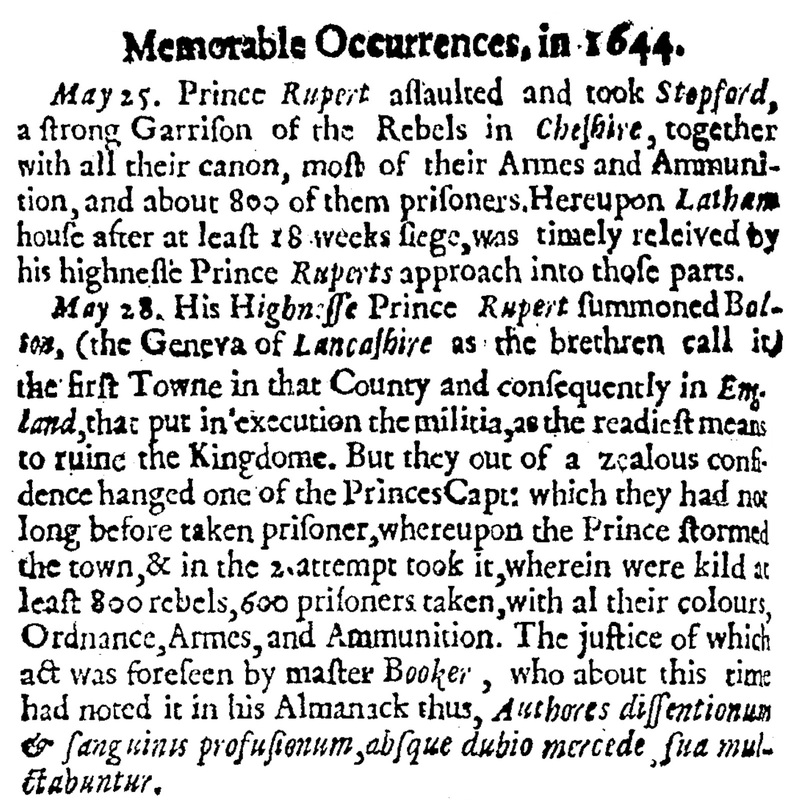 Prince Rupert assaulted and took Stepford, a strong Garrison of the Rebels in Cheshire, together with all their canon, most of their Armes and Ammunition, and about 800 of them prisoners. Hereupon Latham house after at least 18 weeks siege, was timely releived by his highnesse Prince Ruperts approach into those parts. May 28. 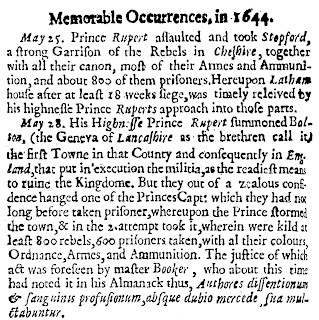 His Highnesse Prince Rupert summoned Bolton, (the Geneva of Lancashire as the brethren call it) the first Towne in that County and consequently in England, that put in execution the militia, as the readiest means to ruine the Kingdome. But they out of a zealous confidence hanged one of the Princes Capt: which they had not long before taken prisoner, whereupon the Prince stormed the town, & in the 2 attempt took it, wherein were kild at least 800 rebels, 600 prisoners taken, with al their colours, Ordnance, Armes, and Ammunition. The justice of which act was foreseen by master Booker, who about this time had noted it in his Almanack thus, Authores dissentionum & sang uinus profusionum, absque dubio mercede sua mulctabuntur. As noted in a later post, after Bolton Sir Thomas Tyldesley obtained leave from the King to proceed to Preston with 2,000 men. 1. Englands Iliads in a nut-shell. Or, A briefe chronologie of the battails, sieges, conflicts, and other most remarkable passages from the beginning of this rebellion, to the 25. of March, 1645, Sir George Wharton, 1645.